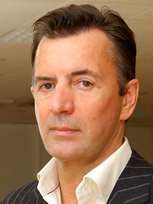 Duncan Bannatyne OBE is one of the UK's most successful serial entrepreneurs who has created a portfolio of leisure businesses as well as carving out a high-profile media career. Duncan is best-known as one of the original Dragons on BBC's Dragon's Den, where his sharp comments put would-be entrepreneurs on the spot and saw him investing millions in new businesses. Duncan's other television work includes ITV's The Rich List and Bannatyne Takes On Tobacco a documentary for BBC2 on the tobacco industry. He also fronted Duncan Bannatyne's Seaside Rescue on Virgin 1 helping to revive some of Britain's fading coastal resorts. Alongside his television work Duncan is a successful writer with his memoir, Anyone Can Do It, which was published by Orion in 2006 and he has since written a series of successful books on business. Duncan is a committed fundraiser and supports many charities including UNICEF, Scottish International Relief and Comic Relief. He was awarded an OBE in the 2004 Queen's Birthday Honours for his services to charity. He was awarded an honorary Doctorate of Science by Glasgow Caledonian University in July 2006 for services to business and charity and was also awarded a Doctorate of Business Administration from the University of Teesside in February 2009. 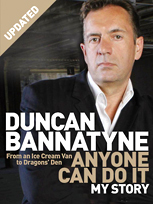 Duncan appeared in his last series of Dragon's Den 2015 and joined the line up for I'm A Celebrity Get Me Out Of Here. He also appeared on ITV'sBig Star's Little Staralongside his granddaughter.